Patrick Witt sexual assault charges: How should the press have reacted? 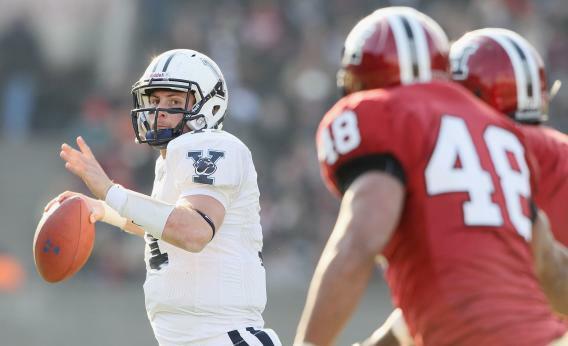 On Friday, the New York Times published a story revealing that Yale’s football hero, Patrick Witt, may have been involved in an instance of sexual assault. Witt was the quarterback who became a media idol after electing to play in the Harvard-Yale game, scheduled for the same day as his Rhodes scholarship interview. What we know: An anonymous source alerted the Rhodes Trust to a (deeply murky) informal complaint lodged against Witt in September. The trust then requested an additional letter of support for Witt’s candidacy from Yale. And at some point near or during this swirl of sub rosa communications, the student-athlete decided to forfeit his Rhodes scholarship interview for the game. Friday morning, frustrated by a university that finds ever-new and inventive ways to heap ignominy on itself, and mourning my lost sports idealism, I banged out an angry blog post criticizing Yale for promoting an untruth—namely, that Witt had withdrawn his Rhodes application out of loyalty to his team. I assumed that Witt had actually declined the interview because he believed his candidacy was compromised by the sexual assault complaint. But, as commenters have pointed out, we don’t know when Rhodes informed Yale that they wanted a letter of re-endorsement for Wit, nor when (or if) Yale told Witt his application was in jeopardy. I shouldn’t have concluded that Patrick Witt made his decision to play at Harvard-Yale in light of doubts about his Rhodes application. And I shouldn’t have automatically faulted Yale for acceding to the narrative in which Witt chooses team fealty over personal glory. The Yale administration needs to demonstrate that it protects women by adopting transparent, decisive sexual grievance policies. In doing so—provided he’s innocent—it will also protect the next Patrick Witt.